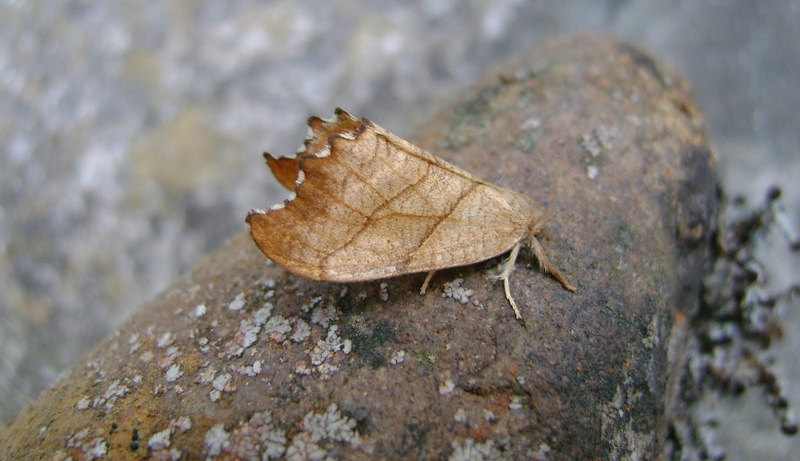 Last night (8/6), Chris Manley and I spent a couple of hours moth trapping (to about 12.30am) at the old lead mine site near Nant y Bai, Rhandirmwyn, right in the far north-east of the county. It was a long drive (about 1hr 20mins, one-way, for me) but I`ve always wanted to trap at this fantastic site with the aim of targeting certain moths. Did we succeed/was it worth it? - only partially. Did we enjoy - yes and no! 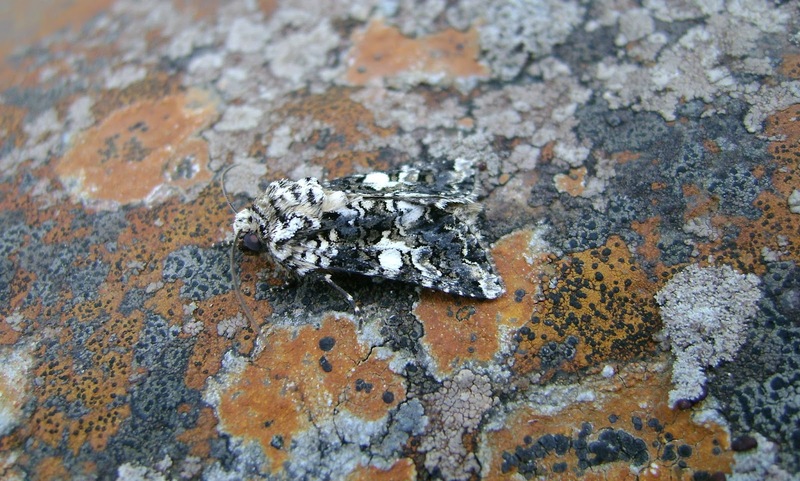 `Yes`, because of the good company and the capture of a few interesting moths in a very atmospheric location but `no` due to the sheer hell of millions of midges. The midges got into our eyes (I looked as if I had been wearing mascara when I later looked into a mirror), we inhaled them, causing both of us to choke and cough - even though we were dosed with ample insect repellent. But it`s a truly wonderful location and I`m already planning a return trip - to get a scarce silver y, perhaps (`a moth in the pot is worth two in the bush`). We were (expectedly) too early for scarce silver y but there were silver y`s in some quantity, nectaring at the honey-scented flowers of the abundant sea campion that abounds on the metalliferous rocks and mine scree. I noted c 30 on a dusk walk. I was hoping for tawny shears (associated with sea campion) but saw none, though campions were noted. 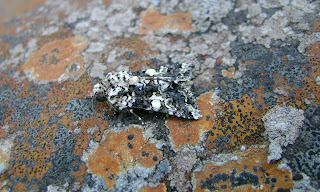 Diamond-back moths were also present (as they probably are over all of Carmarthenshire!). Above: Chris `dusking` along the stream. Above: one of my actinics, set up to overlook the shingle - note the swathes of sea campion. This trap was particularly `midgy` from an early stage, but all of them would hold dense clouds of the mini-terrors! Chris set his traps (all generator-run) a little further down the valley and I had two other battery-powered actinics at the edge of the adjacent spruce plantations. 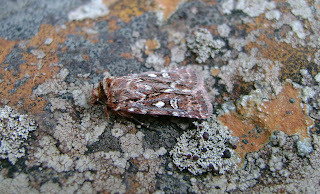 Above: marbled coronet - probably the caterpillars utilise the sea campion swathes. There are also some older Rothamsted records from Ty`r Ysgol, Rhandirmwyn that probably represent wanderers from the lead mine site. Above: dark brocade. I had three of these and Chris also had at least two others. Above: true lover`s knot, a frequent species of acidic/upland habitat. 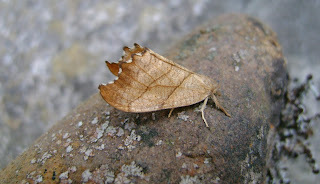 Above: scalloped hook-tip (female) - a fairly widespread birch-feeder. I`ll add some more photos later, including a quite distinctive pug (but my brain cells need replenishing first) and a tiny tortricid (which I know that Chris also caught - he may well later post his photos with a `det.` himself - see subsequent blog post). 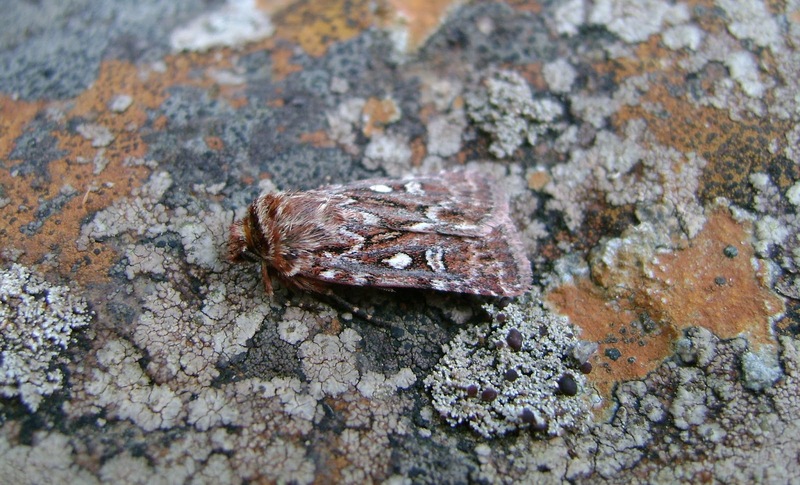 Remember that National Moth Night/s (9-11th June) starts tonight, so please trap...the weather may be much better tonight (Thursday) than the other nights - check the forecast. I`ll be trapping somewhere.